Born Yvonne Jasme, big band vocalist Connie Haines began singing and dancing at an early age. Her first break came in 1935, at age 14, when she won an amateur contest on Fred Allen’s NBC radio program. During the late 1930s, she worked for Howard Lally’s orchestra. In 1939, bandleader Harry James heard Haines rehearsing at a New York music publishing company and hired her for his band, changing her name. She left James the following year and kept busy with solo engagements around the New York area before being hired by Tommy Dorsey, where she joined former James bandmate Frank Sinatra. In 1941, she was named eighth most popular female band vocalist in Billboard magazine’s annual college poll and tenth in 1942. In March 1942, Haines left Dorsey’s band temporarily due to illness. The leave soon became permanent, though Haines did not lack for work. She became featured vocalist on the NBC Blue program Music by Dant in April and made several soundies for RCM over the spring and summer. 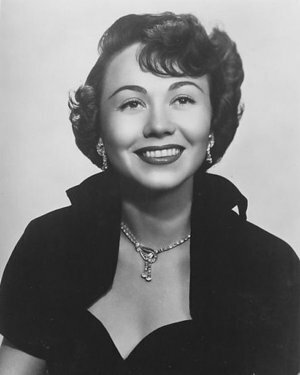 Around that same time, she also provided vocals for Gordon Jenkins’ orchestra on the brand-new Capitol label. In September 1941, Haines landed the spot as featured vocalist on Abbott and Costello’s new NBC radio program. She spent four years with the show, leaving in January 1946, replaced by Amy Arnell. Haines had a long and successful solo career. She appeared regularly on radio during the mid-1940s, on a number of shows for both NBC and CBS, and later ABC when the NBC Blue network was spun off. She also appeared in several films and on television during the 1940s and early 1950s. She toured heavily on the theater and nightclub circuit, recording on the Mercury label in the mid-1940s. She recorded for Coral in the late 1940s and early 1950s. Haines remained popular through the late 1950s until a crippling condition sidelined her for two years. Deeply religious, she became a minister soon after her recovery and led a singing ministry alongside continued performance as a pop artist. A series of life-threatening illnesses plagued Haines for the rest of her life. She passed away in 2008. Simon, George T. The Big Bands. 4th ed. New York: Schirmer, 1981. “Phil Spitalny.” IMDb. Accessed 30 Dec. 2015. “Orchestra Notes.” Billboard 7 Mar. 1942: 25. “Talents and Tunes on Music Machines.” Billboard 14 Mar. 1942: 73. “Talents and Tunes on Music Machines.” Billboard 11 Apr. 1942: 67. “Campus Picks Top Chirps.” Billboard 2 May 1942: 19. “Collegiate Choice of Female Vocalists.” Billboard 2 May 1942: 21. “Movie Machine Reviews.” Billboard 6 Jun. 1942: 67. “Movie Machine Reviews.” Billboard 4 Jul. 1942: 70. “Record Buying Guide.” Billboard 25 Jul. 1942: 96. “Movie Machine Reviews.” Billboard 22 Aug. 1942: 63. “Movie Machine Reviews.” Billboard 29 Aug. 1942: 77. Abbott, Sam. “Radio Talent: Hollywood.” Billboard 3 Oct. 1942: 57. Thomas, Bob. “Singer Connie Haines Makes Brave Comeback.” Ludington Daily News [Ludington, MI] 13 Jan. 1960: 10. Gillmon, Rita. “Now Connie Is a Singing Missionary.” Rome News-Tribune [Rome, GA] 2 Feb. 1979, 4-B.